A 12 volt mini gas alarm with dual sensor that can detect a potentially serious gas leak and warn you with an audible alarm and visual red light. 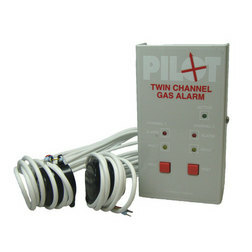 Multiple Pilot Gas Alarm with Dual Sensors can be linked together forming a networked alarm system. A 12 volt mini gas alarm with dual sensor that can detect a potentially serious gas leak and warn you with an audible alarm and visual red light. The dual sensor can also become part of a network of further Pilot dual gas alarms that can be linked together for larger vessels. With an easy operation, single button control, you can install this boat gas alarm onboard as a safety precaution. The gas alarm can be installed into an inconspicuous location and the gas leak sensors can be installed up to 3.5m away from the alarm itself with the included cable. With the Dual sensor Pilot Gas Alarm it is possible to connect multiple gas alarms together in a network to increase the number of sensors that can detect gas throughout your boat. This is particularly important if you have multiple gas supplies or a larger boat. This method of networking the alarms allows the system to recognise multiple sensor and if a gas leak is detected by one sensor all the alarms throughout your boat will sound immediately. The gas alarm that detected the original gas leak will show a warning LED to help locate the leak faster.